Episode 33a - Because Kristina sounds so adorable. Regular episode just sped up because it's cute. This week, we jabber on about NASA, Destiny, Mark Hamill, A little spoiler for the most recent Doctor Who and then I torture James during Useless Facts. Oh, and listen for the guest appearance of James' beloved chilluns! I also apologize if I missed any of my throat clearing while editing. It's another quick and dirty done just this morning. James went AWOL, I went snooze and we still don't know what the Fox says. I babble a little about Friday the 13th the game, Apple iPhone 8, Atari and then I share my Father's Day gift from my youngest. I hope you enjoy it. Alan and Friends - Episode 30 - The Apologies! This week, I apologize to you listeners for missing last week, and give a couple reasons. We talk about creepy songs that we never noticed as a kid. We have random facts. Finally, I apologize to the OFTU guys for my sad attempt at starting a feud. I promise, no more mention of 40 mph winds after this episode. All in all, I thought this was a good funny show. Also, starting next week, we'll be returning to Monday release days. My moving to Wednesday was supposed to help my weekend, but I just found it made the rest of the week too busy. Alan and Friends - Episode 29 - Traitor Jim! Within this recording I strut and try to look big because of some other Podcast's bullying and casting aspersions upon the gifts that were sent in only the purest form of love. Then we get facts. Then we babble about snakes and bees. Then that lowdown dirty snake, JIM, throws me to the OFTU wolves and giggles about it. Shorter show, but still fun. Come! Laugh at my pain! Alan and Friends - Episode 28 - HELLO! Description goes here! Useless Facts! A little about The Dark Tower! A Little More! A Little More! And lots of laughs. Join us or di.... not! This week we talk about Star Trek, mostly Nemesis, Chuck Norris facts and very little else. Good times were had! Also, James had a birthday and never mentioned it on the show, so this week gets a cool pic of him! Alan and Friends - Episode 26 - May the 4th! This one's a quick and dirty episode. I whine a lot and talk about Flash, Doctor Who, people who want to be equal and then yell "LOOK AT ME!" Then I fail to make a point. Alan and Friends - Episode 25 - Uncultured Swine! This week we babble on about things like the X-Men universe, Ridley Scott, Salvador Dali, Ugly Kansas and many other things that I can't remember. We had fun, join us and try not to wonder how quickly we would die if we were left in New York. Alan and Friends - Episode 24 - Block! Block! Block! Block! A day late and no excuse, I just have an overly comfortable chair. This week we talk about Terry Crews, Overwatch, have a random fact dump and then a lot of babbling. It's fun! Enjoy! Do it! DO EEEET! Alan and Friends - Episode 23 - Srsly? Total awesome! You will not be disappoint! Alan and Friends - Episode 22a - Redux! This week James and I do more babbling and try to have fun. It's a fun little romp around our heads, but I failed to get some subjects so... yeah. If you don't want to waste time, try 22a! James and I at 1.5 speed, a la Chipmunks! Believe me, it's a lot funnier. Alan and Friends - Episode 21 - Where's the Beef? I can't really describe this one well, we just kind of have a meandering conversation. Relax with us as we forget we're supposed to be entertaining and just talk. Careful, we were accidentally funny in this episode. We talk about Star Trek, Flying Cars, Amazon and many other things. James is trying to start a podcast war, and I keep trying to steal his thunder. Finally, we manage quite possible the worst KHAAAAAAAAAAAAAAAAN! scene reading -ever-. All that and more! I apologize again for the lateness, I procrastinated and then passed out, but here it is! James and I stumble through, trying to overcome the useless time change, and talk about things like Logan and his cigars, Multiverse, multiple timelines, Harry Potter, DDPYoga people and much more! 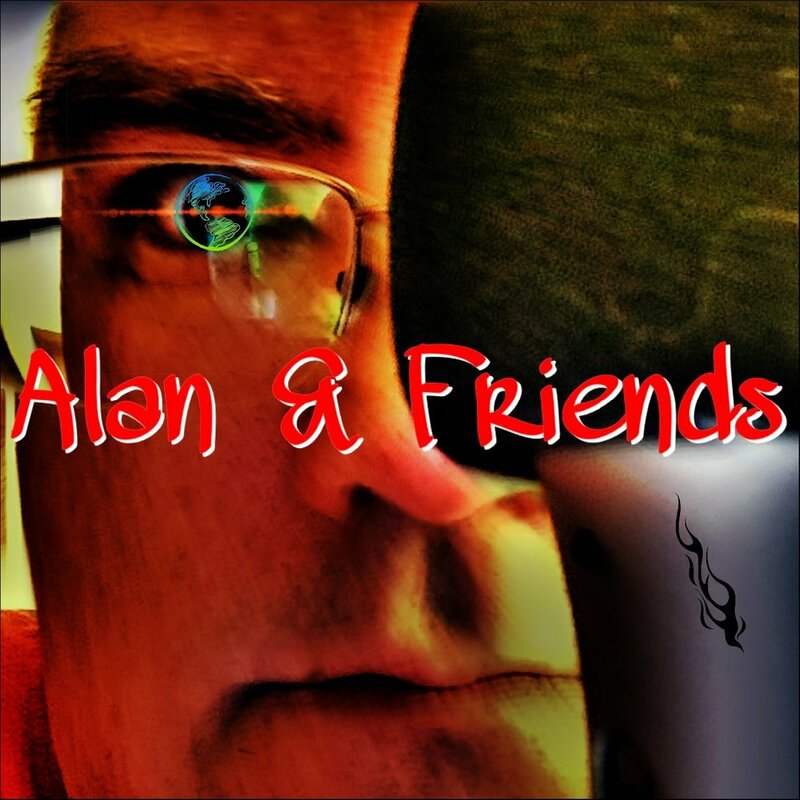 Alan and Friends - Episode 18 - Tea, not sweet tea! This week we babble... and babble... and talk about Deadpool! There's more to it, but we don't get structured enough. James gets revenge, twice and Alan does a lot of editing. Have fun! Alan and Friends - Episode 16 - FLUFFY! This time, James and I talk about other podcasts and how important listener support is. Trump's vaguely mentioned, I sound meaner than planned when shutting James down. We dance on the racism line because I forget how many people of all races that move around the US. We talk about our animals and some science/game stuff. Allow your demented side to come out. Its a nice walk in the park! This time, James and I ramble on about Facebook, Super Troopers 2, Murphy beds and the usual stuff. I know it sounds way too exciting, but stick with us, we calm down. *L* It's a fun show! For us, anyway!